Nestled in Chicago's Albany Park neighborhood and a hop, jump, and skip away from the Kedzie Brown Line 'L' stop, is a sunny sanctuary that's changing young lives one spoke at a time. 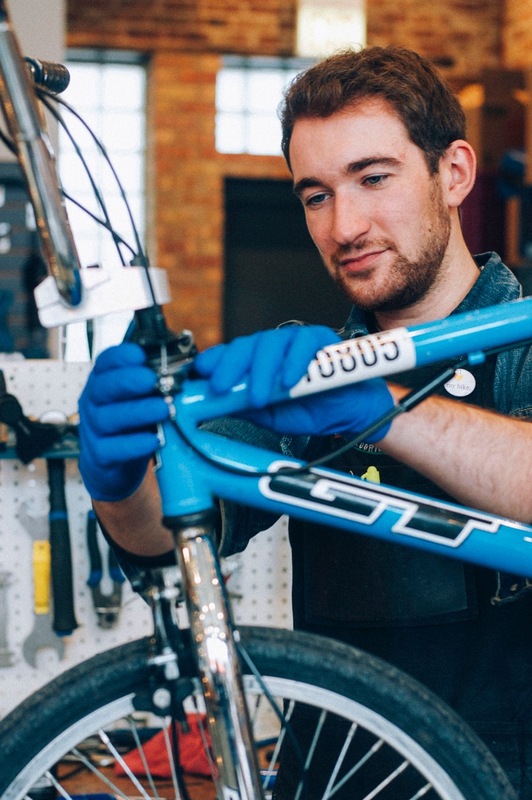 Since 2011, Bikes N' Roses has provided local city youth with a safe community that teaches them the fine art of bicycle maintenance. I had the pleasure of visiting their newest location and chatting with Program Director David Pohlad. Basking in the natural light of their open space while sitting at a countertop across from David, it was easy to see how friends of the organization often found themselves spending hours in the shop drinking coffee and catching up. Big thanks to David for giving us the lowdown on this special Chicago gem. S: What is the history of the organization? D: It all started in this neighborhood by a group of teenagers over at Roosevelt High School. It originally started as a bike club, there was no storefront or central location, they would just go to churches and community centers and help people fix their bikes and organize group rides. It was entirely started by youth, which is cool — that's as grassroots as you can get. After a few months of these kids working, our umbrella organization Communities United found them and started funding them. With the help of a professional mechanic, they were able to open an official storefront in 2011. Since then we've had three other storefronts before this one. Now we're at this point where we have this really big, pretty place and a second location on the West Side. S: What does a typical day at Bikes N' Roses look like? If there even is a typical day! D: On an average day we usually open at eleven and the kids don't come in until about two or three, because they're either in school or sleeping in on the weekends. I like the mornings because it gives me a chance to catch up on repairs. Around three, another paid mechanic and I work together so that one of us can work with the youth and one can work with the customers. Usually I work with the youth because I like it more. S: What does the future hold for Bikes N' Roses? group rides, immigrant outreach, and organizing bike clinics at community centers. We want to work with as many kids as possible. S: How can people outside the organization get involved? D: A lot of adults come in and want to volunteer, but since we have limited resources, I generally hoard our bikes for the youth. There's a few adults who know what they're doing so they'll fix bikes that we sell in the storefront, which is fine because it brings in money. We have a couple hundred bikes in the basement right now and I want those all for the kids, for the learning process. The best thing for people to do is contact us and ask. There's always something going on that's way over our heads so we can always use the extra help! S: What are some springtime tips you have for bikers? D: Well, if people have been riding all winter it's time for a tune up, or a really involved check up. The winter is really harsh on anything mechanical. As far as preemptive measures, buying a bike in the spring is always very expensive. If you're trying to get a deal on a bike, it's better to buy in the winter. Spring is a great time to ride! S: What do you think makes Bikes N' Roses so unique? D: It's not a business — we're a registered state nonprofit. It runs like a business and some people come in and treat it like a business, while others come in and treat it like a nonprofit. There's no real way to train yourself for a job or program like this. Each kid is different and being able to work with twelve kids at a time and catering to each of their preferences and needs when it comes to learning is a little bit tricky. I think they come here for a reason and bikes are an easy medium to work with when you're trying to interact with kids. There are a lot of interesting parts, every day is new. Visit the Bikes N' Roses website or Facebook page to learn how you can get involved. Give your bikes the love and tuneups they need after a long winter. For local Chicagoans, keep an eye out for awesome events hosted in and outside the Albany Park storefront!